Given the horse meat scandal currently turning the stomachs of British shoppers in the frozen food aisles, watching John Huston's The Misfits proved a surprisingly topical move. Best known for providing a swansong for two of its great stars - Marilyn Monroe and Clark Gable - Huston's film from playwright Arthur Miller's script is a bold and unusual, almost European art house-style meditation on the sad truths undermining the American Dream. 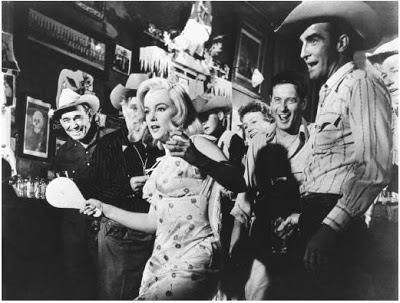 Monroe plays Roslyn, a sensitive young woman who visits Reno, Nevada, to obtain a divorce with her friend, Isabelle Steers (Thelma Ritter), on hand to provide moral support. The two women encounter mechanic Guido (Eli Wallach) and ageing cowboy Gay Langland (Gable), whom Ros quickly falls for. Shacking up with Langland, Ros initially embraces and idealises life on the range before the harsh commercial realities of her surroundings hit her hard. She learns that the Old West is not what it was: its stetsoned rodeo riders now conflicted, self-destructive drunks and its cowpokes reduced to rounding up wild mustangs to be slaughtered and processed into tinned dog food. Despite its troubled inception and tragic aftermath, The Misfits is ravishingly shot in cool black-and-white by cinematographer Russell Metty and offers a bleak, distorted reflection of the mythic landscapes of the West John Ford once brought to us on the same canvas. As a discussion of punctured illusions and romantic disappointment, it's hard to argue with, playing on the public's knowledge of its actors' private lives, notably the 1956 car accident that left Clift disfigured and allows his Perce Howland to appear so fragile here. 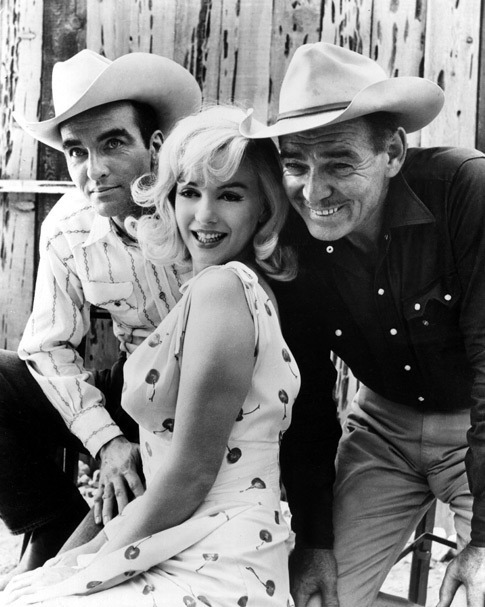 What dates The Misfits is undoubtedly its excessive speeches, with each of these beautiful losers given ample screen time to express their existential crises and hysteria at length. Miller's screenplay was clearly built as a vehicle around which Monroe, his then-wife, could showcase her serious acting chops, although this hardly matters because she is utterly radiant, not least when entrancing an entire bar-full of revellers with her paddle ball expertise. Such colourful incidents are the film's real strength. A great deal is lost once Ritter departs and the four leads relocate to a dried up desert lake for the mustang hunt, an episode that drags on for too long and indulges in far too much Hemingwayesque machismo. Huston engaged in a healthy amount of unhealthy living during the shoot, playing blackjack and boozing in the manner of the blustering novelist, and shows the same fixation with the muscular business of lassoing and hog-tying the fleeing horses as Hemingway would have in prose. Gable is amazingly physical in this sequence, despite his age, performing his own stunts with the roped stallion. For me, his frustrated Marlboro Man left alone on the flats to ponder the future ultimately steals the film, although Wallach's lost pilot is also satisfyingly complex. Yes that is very topical about the horses being sold, for animal food here, not in processed food for humans! I was obsessed about THE MISFITS for years, and back in that pre-video world had to see it whenever it turned up on tv or at a revival house. I suppose other Monroe obsessives felt the same. It still looks marvellous now with that luminous black and white photography by Russell Metty and the superlative cast. its amazing now seeing Eli Wallach, the only survivor, still working in his 90s. I confess not being a Misfits fan; I think the scenes of animal cruelty always bothered me too much to want to watch the film more than once or twice. I agree that Gable's character is the most compelling, particularly because of the weight of his star persona that he brings to it and the contradictions that are offered to it by his screen character. I recall one scene he does, when he's drunkenly calling after his (unseen) son, which was such a raw, exposed piece of acting, letting you see the man's confusion, uncertainty, love and pain about his son, and his utter loss of control. It was unlike anything else Gable did onscreen. I can definitely understand your objections to the mustang scenes, it's hard to watch such exquisite creatures being harmed. I guess that was what I was getting at with my Hemingway allusion - it almost feels like we're being shown this upsetting subject matter for the wrong reasons. Wallach and Gable are both great though, particularly the latter in the scene you describe GOM. Gay is dead drunk and broken down with misery and it's a great decision by Huston not to show us his kids. This means that we never know if they were ever really turned up at the bar. He may just be being unspeakably morose.